THE BEST AUTO REPAIR IN JAMAICA PLAIN! Morrison's Auto-Rite Inc Offers Auto Repair Services You Can Count On! 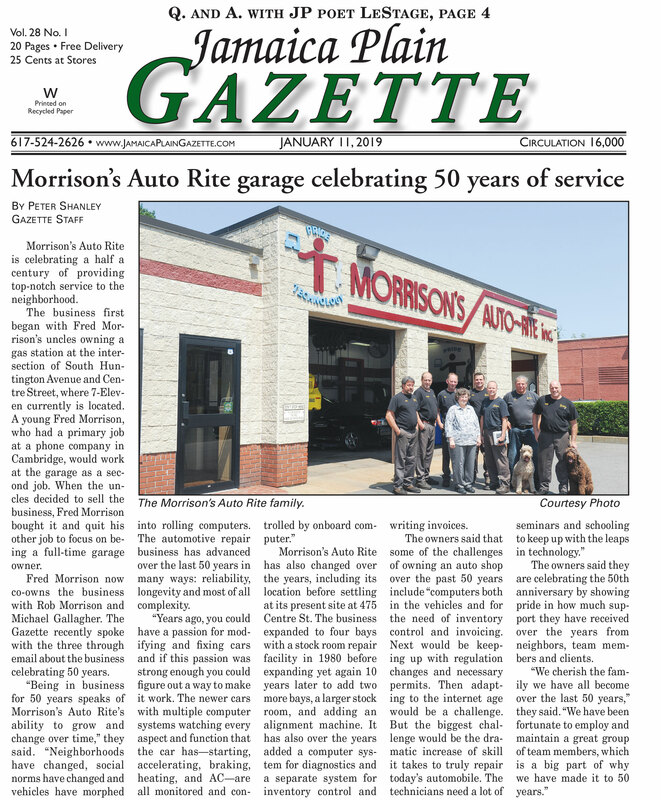 Morrison's Auto-Rite Inc has been providing customers in the Jamaica Plain, MA 02130 area with high-quality automotive maintenance and repair services since 1969. Our experienced mechanics will get your vehicle up and running again, and we'll keep it in top operating condition. We provide a range of services, including 4x4 Services, Alignment, Brakes, Car & Truck Care, Domestic Cars & Trucks, Electric and Hybrid Vehicle , Electrical Services, Electronic Services, Engine & Transmission, Engine Maintenance, General Services, Heating and Cooling Services, Import Cars & Trucks, Lube Services, Miscellaneous Services, Tires, Towing, Transmission Services and Undercar Services. We're proud of our great mechanics, who have years of experience working on many different types of vehicles. They have the knowledge required to diagnose your problems, and to find affordable solutions to get you back on the road quickly. To learn more about our services, call us at 617-522-4444 or email us today. We're looking forward to earning your trust as a friendly, honest and reliable alternative for your auto maintenance and repair needs in Jamaica Plain. Had some damage to my car after the last snow storm. Called this place up looking for a good local shop and this place totally hits the spot. Friendly, fast, and communicates well, this is a great place to take your car. I was in and out in a day. Highly recommend. Had a WONDERFUL first experience here! Came in for a tire replacement after a flat and they had my car in and fixed by noon the next day. I was expecting to pay upwards of $120 for a new tire but they went the extra mile to examine & patch my tire and it ended up costing me half of what I had planned for. Can't recommend the Morrison's team highly enough!! Never been to a better auto shop. Honest people whose words and advice you can trust. They've saved me a bunch of money by finding solutions that other shops didn't think of or chose not to tell me. I moved to NY and I still come back every time because there's no one better than Morrison's. Great operation and nice people. I don't have any frame or reference, from a price perspective, to compare with but they are a good shop to rely on. Morrison's Auto Rite has excellent mechanics and the team is reliable and trustworthy. They get to know you, your car, and your specific car care needs. I appreciate the friendly, upfront and honest communications. I've been going to Morrison's for more than a decade and I'm grateful to have them nearby. Exceptional service. It all started with my dad getting serviced here for years, and now I do as well. It's a place I can sincerely trust, where I know they take care of my car. Some might believe they say something is always needing fixing, but we do live in Boston where potholes and elements are the enemies. At least I know what ever comes about they can fix me right up! Thanks Morrison for your great team! Very friendly and straight forward. Had my car's problem diagnosed, got parts, and repaired in one day, all while keeping me informed. The office was clean and the location was easy to find and get to. Would definitely recommend for anyone in the area. We have been going here for many years and always satisfied with the level of service and professionalism. My father was an auto technician for 40 years and before I moved to Boston we did all auto work at home. 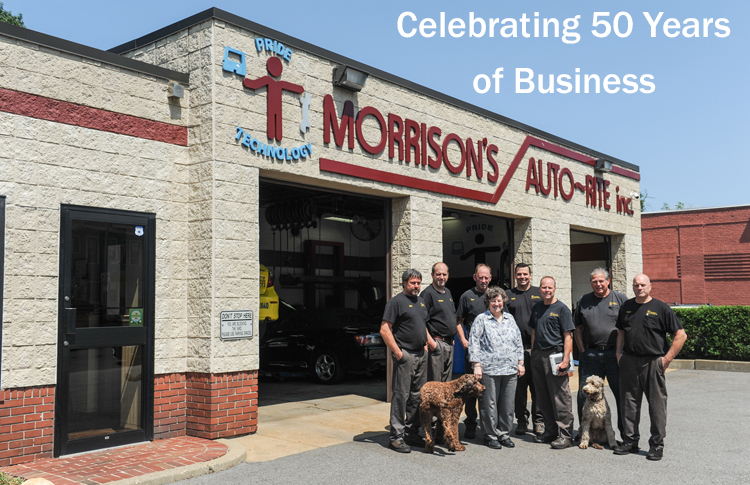 Needless to say, it was difficult at first to let a shop take care of our vehicles but Morrison?s has proven that there are still some quality institutions left! Highly communicative and pricing is fair, couldn?t recommend more! I've been taking my vehicles to Morrison's for about 10 years. Excellent service, every time. I really appreciate the whole picture when it comes to my vehicle, and Morrison's always breaks it down for me into immediate, upcoming, and long-term needs. Mike and Rob are always friendly, personable, and professional even when they have to deliver bad news! I appreciate the honesty and personal touch and always highly recommend Morrison's Auto Rite to anyone who will listen! The customer service at Morrison's is unparalleled. They are so nice! They explain everything. And, of course, the actual repair work is top-notch. Their office is clean and orderly and - get this! - they have cookies and water for everyone. I once had to get my car towed here and it was kind of amazing to arrived from a tow truck journey to cookies. The people at Morrison's are pleasant, courteous and very helpful. The service is excellent. They have serviced my cars for at least 15 years and I have never had an issue. I have recommended them to a number of friends, all who feel the same way. The technicians are thorough, honest, professional, and always give options of when needed work can be done. I recommend them to everyone. This is the second time i popped into Morrison's and the second time they save me money. seriously... the team they have working there is sincere, honest and friendly all these would be the valid reasons to have the highest prices around, but they don't. the perfect neighborhood auto shop. Highly recommended. I've been sending my car to Morrison's for about a year now, and they've always been incredibly courteous and helpful. They explain (sometimes over-explain, which isn't a bad thing) what's wrong and are very up-front with how much things will cost. Morrison's always squeezes me in for service and they're always great about offering to explain things rather than just suggesting a bunch of work that may or may not be needed. They're not the cheapest service in town, but their consistency, quality work, and respectful communication has kept me a loyal customer for 5+ years. Best oil change experience ever. Everyone was so friendly and efficient. No wait to get our car checked in at our appointment time. They had it done promptly and clearly explained the findings from the safety check. The complimentary cookies are icing on the cake. I didn't think I would be saying this, but I'm looking forward to our next oil change! Thanks to everyone for the great service. I've brought my car to Morrison's twice and each time the quality of the work and customer service has been awesome! They really care about making sure you have all the info you need about your car. Highly recommended! I have been going to Morrisons now for seven years and wouldn't choose anyone else to take care of my car. The technicians know cars intimately, and everyone is as honest as can be. Work is prompt and excellently done. They are the BEST. I?ve always had excellent service at Morrison Auto Rite- with a call detailing what work is going to be done and the cost - never any unexpected surprises. I also appreciate the heads up one work that will be needed down the road so I can plan and budget accordingly. Very professional and friendly service. I never hesitate to recommend them to others looking for trustworthy auto repair. Excellent local family-owned business. I've been going here for close to 30 years. Scheduling is easy, repairs are done right the first time, estimates are accurate, never any upsell, car is always done on time (or early!) At every oil change they check the car over & alert you to any developing problems and give you a heads up about what maintenance might be required in the next few months. Totally trustworthy, wonderful people. We have been using Morrison's Auto-Rite for about six years since we moved to the neighborhood. Rob, Mike and the mechanics have done a terrific job in keeping our 11-year-old car humming. When we've bought the car in for a specific issue, they've done thorough checks and spotted potential problems early before they became more difficult and costly. The mechanics at Morrison's, moreover, have been very helpful in explaining various options and trade-offs in considering specific fixes. My wife and I have directed several friends to Morrison's. We are happy to provide an endorsement that, hopefully, will assist other drivers in the area and keep customers flowing to Morrison's Auto-Rite. I have been relying on Morrison's Auto Rite for the last forty years. I have continued to rely on Morrison's even though twenty-three years ago I moved to a different part of town and so it is no longer as convenient for me as it was initially. The reason I stay with Morrison's is because their service is extraordinarily professional, very high quality, highly courteous and extremely friendly. Morrison's kept my 1994 Honda Civic's engine running like a new Maserati and the only reason I got a new car in 2015 was because the body of my old 1994 car was starting to wear out. I doubt you can find a better auto maintenance/repair shop anywhere. Over 10 years ago, when we first moved to J.P., a dear friend and neighbor recommended Morrison's to us. It was the best tip ever! Mike, Rob and the gang at Morrison's have taken great care of our cars. They do excellent work, at a fair price, and are honest and reliable. We really cannot say enough good things about them, and how they've taken such great care of our vehicles. Excellent shop. Have been coming here for years both for my new Honda and classic Toyota. Honest, prompt, professional, knowledgeable, and super customer service oriented. Absolutely stand by their work. Can't recommend enough both for regular maintenance and acute issues.